We at Davie Village Registered Massage Therapy are excited to announce that our team has recently expanded! 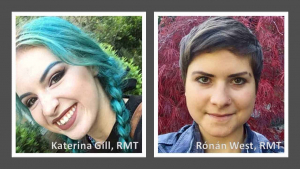 We just added two wonderful RMTs, Katerina Gill and Rónán West. Katerina graduated from Vancouver Career College. Rónán graduated from the Vancouver College of Massage Therapy. They both recently passed their RMT board examinations. Both successfully prepared for this rigorous exam, administered by the College of Massage Therapists of BC. Katerina enjoys treating sports and fitness injuries. She’s also adept at providing preventative treatments. She skillfully treats motor vehicle accidents (MVA’s) patients. In addition, she assists with neurological conditions – Carpal Tunnel Syndrome, spinal cord injuries, Sciatica, and more. Rónán enjoys working with athletes, expecting mothers and the elderly. He treats many conditions and likes empowering individuals in their pursuit of well-being. Both Katerina and Rónán are trained in various massage techniques. For example, they use techniques like Swedish, relaxation, deep-tissue, myofascial, trigger point release, joint mobilization and more. We are happy to have them both on our team. What’s more, we hope that you will join us in welcoming them both to Davie Village Registered Massage Therapy.